I feel that it is necessary to compare the pros and cons of any purchase, especially for my furry babies. I perform a bit of research online to review what consumers thought of the products as well as the official website, when possible, to determine if the product is safe. This is generally enough information to make a purchase decision. What is inside the Perimeter Technologies Wire-Free Wi-Fi Dog Fence Package? How does the Perimeter Technologies Wire-Free Wi-Fi Dog Fence operate? This system consists of a SmartStation (base) and a PetLink (receiver) which attaches to a collar. The base station continually monitors the receiver on your dog’s collar. This on-going communication gauges the distance between the PetLink collar and the boundary that you previously set. This allows you to know where your fuzzy baby is at all times. If he/she passes the boundary, the collar releases an audible warning a well as a mild static correction which is adjustable. It is best to begin with the lowest setting, level 0, and increase the setting based upon your canine’s disposition. Do I need to purchase a computer or order internet services? It is not necessary to purchase any type of services to operate this system. 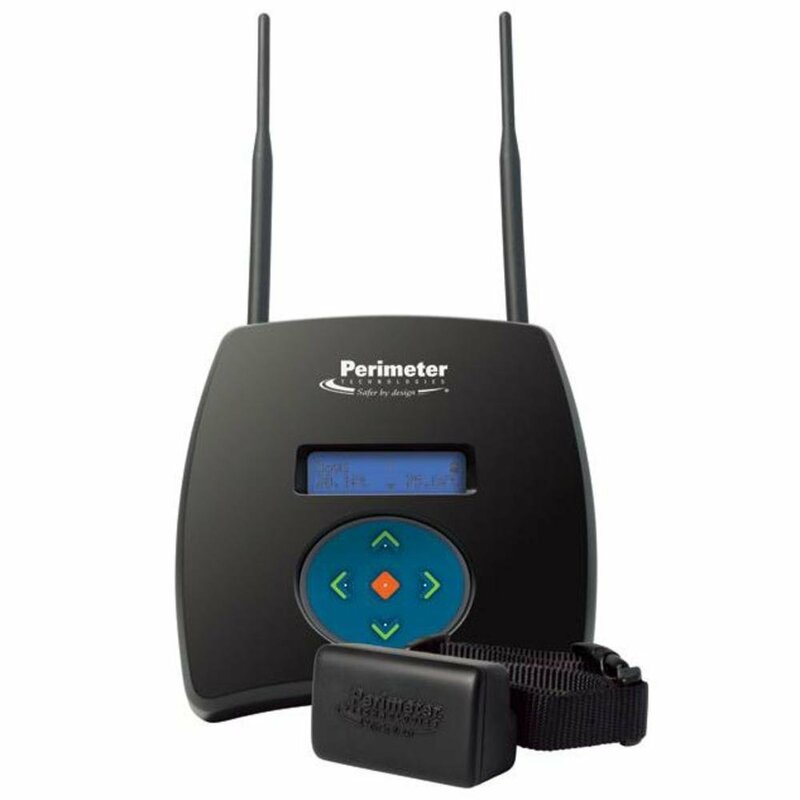 The Perimeter Technologies Wire-Free Wi-Fi Dog Fence functions independently. Can I wash the PetLink collar? The manufacturer states that Perimeter collar is waterproof and that it is submersible. I figure that means it will not damage the device or harm your pup, if it gets wet from rain or he/she decides to run through a creek. In any case, it should not be cleaned in a dish washing machine or clothes washer. The collar may be rinsed with tepid water and gentle detergent. The receiver can be wiped clean. It is essential to ensure the collar and receiver is 100% dry before attaching it to his/her neck again. Does this device cause my canine friend pain? The Perimeter Technologies fence kit will not cause your fluffy friend pain. It only emits a tone sound and gentle static. You can adjust the static to suit his/her temperament and the levels include a setting that is audible only. The static does not hurt, but it can startle and/or annoy animals. It is not recommended to use this collar in training very nervous; aging; highly aggressive; injured; or disabled pets. It may confuse canines who are younger than six months old. Can I use this system to teach my Beagle boundaries? The Perimeter Technologies Fence training procedure may be used for any canine who weighs at least 12 pounds or more. It is not suggested for dogs who weigh more than 100 pounds either. A bathroom scale can be utilized to determine the weight of your fuzzy kid. Does this system include a warranty? The Perimeter Technologies Wire-Free Wi-Fi Dog Fence has a one year limited warranty as long as the product has been registered. It is best to do this as soon as it arrives at your home before you place it on your dog. Can my Wi-Fi router cause this system to malfunction? The PetLink and SmartStation do not operate on the same frequency. This fence set up functions completely independent from any other computer system within the household. One of the only function precautions is that it should not be installed more than 3 feet of any structures which are designed from metal materials. What size should my dog’s safe zone be? There are several elements which determine what size range the fence will operate in. For example, steep hills and dense woods may interfere with its operation. In an optimal environment the system should function fine in an area up to 2.5 acres or within an area which has a 400’ diameter. How often will I need to purchase batteries? This dog training fence package includes two rechargeable batteries which should recharge for up to 300 cycles each. The SmartStation is capable of charging the batteries and batteries must be charged for at least 6 hours before the first use. The SmartStation only requires about 4 hours for subsequent recharges. The charging system is very convenient as one battery powers the collar/unit the SmartStation recharges the other. Should there be a power outage the battery charging in the SnartStation can power the base station for a short period of time. This is generally plenty of time to wrangle your furry baby and bring her/him inside for safety. The Perimeter Technologies Wire-Free Wi-Fi Dog Fence is an instruction aid only to be utilized with your supervision. The owner’s manual provides training tips; however, it is good to spend around 20 minutes instructing your baby each day. Never leave the collar on him/her when the training period is complete. It is not recommended to use this collar for more than 12 hours each day. Most canines pick up the concept rather quickly; however, training duration varies from dog to dog. Never use system on any other species. It is intended for canines only. It is not intended for canines which may have descended directly from wolves as it may produce extremely negative results. If you allow your dog out without supervision remove the collar. Never leave it on your fur baby when you leave home. Never rely on any training collar/fence to keep your dog from busy streets. The Perimeter Technologies Wire-Free Wi-Fi Dog Fence is a great instruction method for establishing yard boundaries for your dog. Read the included manual prior to placing it around his/her neck. It does not harm animals and the static correction is mild as well as adjustable. It is best to seek professional medical council before using this collar to train dogs whose health may be compromised. If you’re interested, make sure to check out Amazon.com’s price on this fence before purchasing.